My boy Tyler will be excited to learn that my Buddy Kevin Garnet won his championship tonight. It would have been sort of nice had the Wallaby lead Lakers showed up to play the game as well, but you cannot have everything I guess. It was sort of exciting to watch the Lakers get just embarrassed. They did not get the win by 40 ... but it was close (39 points is what they won by, the slackers). I stole this picture of KG from http://www.nba.com . There is a guy on the light rail dressed in business casual with a skateboard. He is probably about my age. The skateboard does not really fit with the clothes, but the skateboard is a great idea. I cannot skateboard, so I would have to learn to pull it off, but if I had the skills I think I might bring one along. The only disadvantage of riding the light rail vs driving is the amount of extra time it takes and the skate board would take walking time down a bit. 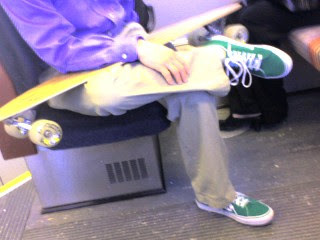 This is the first adult looking guy I think I have seen on the light rail with a skateboard. I sort of expect to start seeing more. This guy has green tennis shoes on. The green shoes do not go with the tan dockers, but I think the shoes themselves are pretty cool looking. It takes a little daring to pull off wearing green shoes. I bet most of the Red Wings would be afraid to wear green shoes. My buddy KG wears green shoes now that he plays for the Celtics. I do not really love the Celtics, but I do like Garnet and I dislike the Lakers, so I hope the Celtics win tonight. If not tonight I cannot imagine LA winning two in a row in Boston, but I suppose anything is possible. Tyler gave Kobe Bryant a cool nickname Sunday night when we had our Father's Day dinner at Wild Wings. The NBA game was on and Tyler called Kolby "Micheal Jordan Wallaby". Of course he got that because he misheard me say Kobe was a Michael Jordan Wanna Be. We had also seen a bunch of wallabys at the zoo earlier in the day. I like Tyler's term better. I used it the rest of the game. I will probably call Kobe a wallaby quite a bit in the future. I do not suppose Mr. Wallaby would get caught dead in green shoes. I think I am going to get myself a pair of green shoes. Go Celtics. I heard on the radio today that my buddy Dot Soup (we have a love / hate relationship just like I have with most of my "Buddies") won his third straight Lady Bing (actually Byng .. But I have a mis-spelling of names theme going on here) trophey this year. I have to wonder... Do real hockey players, the ones who actually get to the penalty box for roughing and the occasional fighting penalties, respect the winner of the Lady Bing? The whole concept of Lady Bing is to award the player in hockey who shows gentlemanly conduct on and off the ice. Usually it goes to a great player who does not get very many penalties. It seems like a trophey that a tough hockey player would not consider an honor. Hockey players are not supposed to have tea with crumpets. Of course, I do not necessarily associate being tough with getting lots of fighting penalties. To me, it is just as tough to take a stick to the face, get up, take the penalty and/or get back into he play, and maybe even score a goal. My buddy Joe Sakic has won the Bing in the past, and I actually consider him one of the toughest hockey players I have ever watched. The only fight I have ever seen Joe Sakic in was when he beat up Doug Gilmore (a Blackhawk at the time). Joe got slashed, scored a goal and then beat up Doug Gilmore. But he knows how to get through clutching and grabbing without ever complaining or whining and he lets his goal scoring be the way he strikes out at the other team. He also plays PK and PP and rarely misses a shift. Dot Soup is the same sort of guy I guess. I do not have the same sort of fondness for him as I do for Joe. But I suppose 3 Bings in a row is fantastic accomplishment. And he has the same sort of toughness. Thing 2 probably feels that he got a bad rap when it comes to public perception after the whole Candy Cane Hat Cat incident. Imagine if you will, a young man leaving home in his teens to search his fortune in the big city. He quickly learns that no one in the big city is there to give you anything. He discovers the hard way that seemingly trustworthy people take advantage of naive young men. Food costs money. Housing costs money. No one wants to hire an inexperienced untrained kid, especially one with crazy blue hair. Money runs out. Life on the streets gets hard. And dangerous. A young man will do whatever it takes to survive. His name is not even Thing 2. His parents named him Billy 1. He has two younger brothers Billy 5 and Mikey and a sister named Girl. It was not until he met the Candy Cane Hat Cat that he became Thing 2. And the Cat is a smooth talker. He invites Billy 1 to his favorite Starbucks and buys him a Decaf Latte along with a cream danish. You cannot blame hungry Billy 1 for accepting an invitation for a coffee and some food. The Cat spends the next hour or so telling Billy about all of the Candy Cane Hat Cat's "business interests". You can bet during the first meeting the Cat mentioned nothing about riding around in a big red carton and terrorizing young children and fishes. The Hat Cat probably makes it all sound like he is letting Billy 1 in on the ground floor of an incredible opportunity. By the time the Cat is done with the pitch, the young man is ready to sign up, but the Cat tells Billy to take some time and think about it. In the mean time, here's 100 bucks. Of course 100 is more than Billy has had in his pockets in a long time. Over the course of the next few weeks the Cat has odd jobs for Billy to do for him. They are simple tasks that The Cat overpays for. It is at this time that Billy becomes Thing 2. He is proud to have a nickname from such a rich powerful business cat. And with the money, Thing 2 can afford such luxuries as food and shelter. And then one day the Candy Cane Hat Cat asks "how would you like to make some real money?" He continues by saying something like "now I realize that this sort of opportunity is not for just anybody and if you do not think you can hack it I totally understand, but I think you are just the sort of fellow who would excel at this." And with that flattery, the Candy Cane Hat Cat has Thing 2. And just like that our blue-haired hero is shoved in a red box with Sid, a guy not unlike Thing 2 only more experienced and meaner for have been in the box longer. Fed only Espresso Beans and sugar, stored and roughly transported in a dark crate along with another guy and various junk, can you blame Thing 2 for going berserk when let out? When a large Cat in a big candy cane striped hat comes in your house with a large red crate, do not give him an opportunity to open the box. And if you do, don't shake hands with Sid or Thing 2. And for goodness sake do not let your fish start talking. Talking fish freak out young blue haired men that have been carted around in a big box and fed only espresso beans with sugar for days at a time. By the time the hopped-up Thing 2 had even figured out what was happening, he had been attacked by blue white and red dresses and gotten a kite totally tangled up in everything. Thing 2 was probably relieved when a net scooped him up. Espresso beans will do crazy things to even the calmest best behaved kids who have been cooped up. And who do you think was the scape goat in this situation. You know the Cat never saw the inside of a jail. He and his money even got Sid out with little more than a slap on the wrist. The worst of the punishment fell on poor Thing 2. As always the guy with the least control takes most of the blame. Currently Billy 1 is in rehab for an espresso bean addiction. He is attempting to get his life together, but he will always have that monkey on his back. Every time he walks past a Starbucks (and how far can you go without going past one?) he will have to fight the urge to partake. It is probably only a matter of time until he is back in a big red crate hooked on the beans and out of control. Who is making the Cat accountable for the lives that he ruins? 4 cups in 11 years. It made me sick to see Chelios carry the cup around the ice last night. Remember how 12 years ago the Wings were the team who had gone the longest without winning one? That was much better. Crap. Crap. Crapity Crap Crap. Congratulations to Dot Soup's line buddy on winning the Smythe. Crap. What is up with Pavel Datsyuk's playoff beard? If you cannot grow a beard, just shave it all the way off. Don't do some sort of 13-year old peach fuzz. It makes him look ridiculous. Zetterberg's beard and Holmstrom's more than make up Dot Soup's lack of facial hair on that line. And the dominant play of that line ... really the whole red wing team really sort of makes all criticism mute. Besides, Sidney Crosby's beard is sort of pathetic too (not nearly as bad as Datsyuk's). AND Crosby's first name is "Sidney". Datsyuk is the one guy on the Wings that I don't hate. Well, I should say he used to be the one guy I did not hate. Now, with the way his face bothers me, I might have to reevaluate my feelings for him. The main reason I gave him some love before is because how incredibly fun it is for me to yell "Dot Soup" at the TV. I wonder if he would consider joining the Blackhawks or the Avs. He should be up for free-agency some time, shouldn't he? I wonder if his brothers Noodle, Alphabet, and Tom are also hockey players. Wouldn't it be fun to cheer for the Soup brothers in Blackhawk jerseys? It would be like some of the great brother combinations of all time. Like the Stanzneys or the Sutters or the Ovs. Of course I would really have to hate those guys if they played for the Red Wings... just like I despised the Ovs when 5 of them played for the Wings. It pains me to say this, but the Red Wings are by far the better team. Pittsburgh is certainly talented and out of all the "everyone else" teams this year they deserve to be called second best. Due to my hatred of the Red Wings, I would certainly prefer for the Penguins to win the cup, but unless they find a way to play much better, or Fleury finds a way to play "off the planet" great, I do not see how the good guys will possibly win the next two. Of course while watching the game Monday night, I did not think they could have won that game. As you probably know (actually, two out of the three people who read this blog probably do not know, but that is ok... you know now), Monday's game went into 3 overtimes. I was pissed because my DVR only got me to 10 minutes before the final goal was scored. Usually by sometime in the 3rd period, I am caught up with the live action, but things happened Monday night that made me start watching later than I usually would. So, my DVR stopped recording before I had caught up, and I missed the winning goal. Tonight I not only am telling the DVR to record my standard extra two hours for a hockey game, but I am also having it record a couple of hours after that. So, I should be good for about 5 or 6 overtimes. How much do you want to bet tonight's game is done in regulation? So, we are rooting for Penguins tonight in the Shepard house. Not only because Dot Soup should not be pretending to grow a beard, and not only because I hate the Red Wings, but also because I am not ready for hockey to be done for the year. I feel I got screwed out of the game Monday.